Abby the Librarian: Spaceheadz Giveaway! Be SPHDZ, save the world! You know our former Children's Laureate, Jon Scieszka? Of course you do. 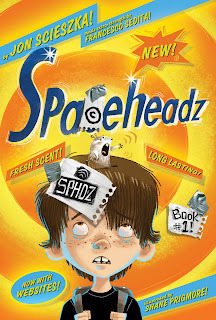 Want a chance to win a copy of his latest book, Spaceheadz? Of course you do! If you've got young patrons who love wacky stories with plenty of humor (pickle phones, anyone? ), you're going to want to check this book out. Check out the work of the Anti-Alien Agency and check in on Mrs. Halley's 5th grade classroom. Take a look at the book trailer and then fill out the form below to enter the giveaway. The contest will be open through September 21 and then two winners will be randomly selected to win a copy of Spaceheadz and a neon Spaceheadz pencil. This giveaway is open to United States residents only. Giveaway is being provided by the publisher.